COLOMBO, Dec 26 (Reuters) – Sri Lankan shares touched a near two-week closing high on Tuesday, as investors picked up banking and diversified stocks, with muted trading as investors went on holiday in the Christmas week. Investors were also waiting for direction on interest rates when the central bank unveils its monetary policy later this week, analysts said. The Colombo Stock Index ended 0.42 percent firmer at 6,350.30, its highest since Dec. 15. “The overall uptrend is due to some window-dressing in some of the blue chip counters,” said Dimantha Mathew, head of research at First Capital Holdings. Shares in conglomerate John Keells Holdings Plc gained 1.1 percent, while Sri Lanka Telecom Plc ended 4.1 percent higher and Hatton National Bank Plc rose 0.2 percent. Turnover stood at 153.8 million rupees ($1.01 million), below this year’s daily average of 923.2 million rupees. Foreign investors net sold 4.1 million rupees worth of shares on Tuesday, but they have net bought 18.4 billion rupees worth equities so far this year. Listed firms earnings dip 2% to Rs. 60 b in Sept.
Earnings of listed companies in the September quarter have declined marginally by 2% to Rs. 60.1 billion largely owing to a weaker performance by diversified financials and energy sector firms. Analysing interim financials reported by 275 companies, First Capital Research revealed that September quarter earnings marginally dipped 2% YoY to Rs. 60.1 billion (Sep 2016 – Rs. 61.6 billion) driven by the adverse performance of the Energy (-108%YoY), Diversified Financials (-18%YoY) and Consumer Services (-54%YoY) sectors. “The dip in earnings diminished the effect of positive earnings growth in the Food, Beverage and Tobacco (+9%YoY) and Banks (+6%YoY) sectors and one-off gains in the Food, Staples and Retailing (+178%YoY) sector,” First Capital said. It said the primary source of decline in September earnings was the Energy Sector (-108%YoY) which saw a loss of Rs. 137 million (September 2016 = Rs. 1,731 million), driven by LIOC (-112%YoY) and LGL (-85%YoY) attributable to higher oils prices and LP Gas prices that drove costs while the selling price remained fixed. The Diversified Financials sector (-18%YoY) also almost equally contributed to an earnings dip where profits declined to Rs. 8.3 billion (September 2016 = Rs. 10.1 billion) driven by LOLC (-23%YoY). Most finance companies in the sector saw higher net impairment losses as the effects of floods spilled over to the September quarter. Consumer Services sector (-54%YoY) earnings dipped to Rs. 744 million (Sep 2016 = Rs. 1,613 million) driven by KHL (-71%YoY) which saw several hotels closing for refurbishment. The negative effect was partially diluted by the positive earnings growth in the Food, Beverage and Tobacco sector (+9%YoY) to Rs. 12.5 billion (September 2016 – Rs. 11.5 billion) driven by BUKI (+788%YoY) and CARS (+2,419%YoY) which saw a dramatic increase in its gross margins while also being supported by plantation companies amidst higher tea prices. The Banks sector (+6%YoY) reported earnings of Rs. 15.5 billion (Sep 2016 = Rs. 14.6 billion) driven by COMB (+11%YoY) which saw a healthy growth in net interest income. However, First Capital Research said the largest positive effect on earnings came from the Food and Staples Retailing sector (+178%YoY) which recorded earnings of Rs. 2.7 billion (September 2016 = Rs. 960 million) driven by CARG (+189%YoY) which included a one-off non-operating gain of Rs. 1,012 million from the sale of its properties in Colombo 2. Having adjusted this one-off gain, the sector’s earnings dipped 33%YoY to Rs. 645 million while the quarter’s overall earnings dipped 6% to Rs. 58 billion. ECONOMYNEXT – Sri Lanka’s banking sector remained the largest contributor to earnings of firms listed on the Colombo stock exchange in the March 2017 quarter, helped by interest rates spreads, First Capital Equities said in a research report. Earnings were up by 7.1% in the quarter to Rs 65.5 billion from a year ago and 0.2% from the previous quarter, for 278 companies analysed by the brokerage, excluding a large one-off gain made by the LOLC group. March quarter earnings grew 16.1% from a year ago to Rs 75.9 billion, including the one-off gain from LOLC amounting to about Rs 10.4 billion. Earnings were dominated by healthy performance in the banks sector (+21%YoY) and diversified financial sector (+194%YoY) with higher margins and one-off gains from LOLC Group, the report said. The interest rates spreads boosted the banking and diversified financials earnings, First Capital Equities said. The banks sector made a profit of Rs 14.36 billion, up 21% from a year ago, and the diversified financial sector Rs 17.42 billion, up 194% from the year before, primarily led by expansion in margins and one-off gains from LOLC Group. Big banks led by Sampath, whose earnings grew 30%, Commercial Bank of Ceylon, whose profits rose 17% and HNB with a 16% YoY growth in profit, jointly represented 70% of the sector earnings. The Food Beverages & Tobacco Sector grew 28%YoY and Capital Goods Sector 42% YoY which was positively affected by healthy consumer spending, First Capital Equities said. “Improved consumer demand, increased volumes and commodity price volatility led to a boost in profitability in Food, Beverage & Tobacco and Staple Food Sectors by 28% year-on-year,” First Capital Equities said. “However, the earnings growth was partially offset by Telecommunication Sector, which fell 32% YoY, mainly owing to foreign exchange losses, and Real Estate Sector which dropped 59% YoY, mainly because of RIL reported a lower profit than the previous year when earnings were boosted by a fair value adjustment. June 21, 2017 (LBO) – The Central Bank of Sri Lanka is expected to keep key interest rates unchanged in its monthly monetary policy announcement on Friday, with slower first quarter growth and a deceleration in inflation contributing to the decision, First Capital Research said in a pre-policy research note. GDP growth for the first quarter was slower than expected, growing 3.8 percent year-on-year, with the agriculture sector decreasing 3.2 percent year-on-year due to drought. CCPI based headline inflation, decelerated on a YOY basis to 6.0% in May 2017 from 6.9% in April 2017, and CCPI based core inflation also decelerated to 5.2% in May 2017 from 6.8% in April 2017. 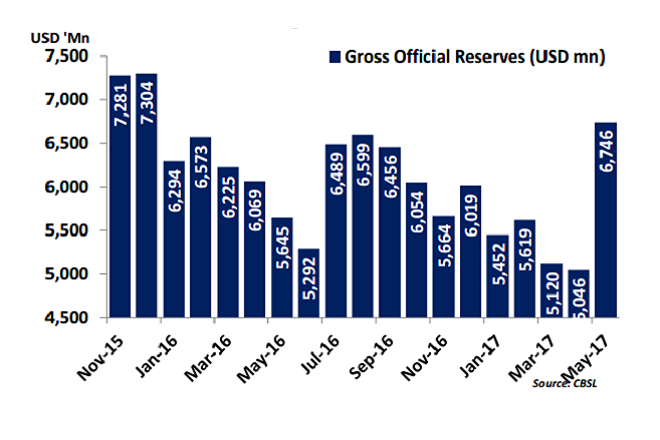 Sri Lanka’s forex reserves rose to USD 6.8Bn in May 2017 from USD 5.0Bn in April, helped by a 1.5 billion dollar sovereign bond sale, 450 million dollar syndicated loan and dollar purchases by the central bank. “Foreign Reserves are now at comfortable levels,” the note said. Commenting on private sector credit growth, FC Research expects that the growth in private credit to descend towards around 18% to 20% from the current level of over 20%. During the last one-and half months the central bank also bought down its holding in Government Securities from LKR 300Bn to below LKR200Bn as at 19th June 2017. First Capital Research said there was a 85 percent probability rates would remain unchanged, and a 15 percent probability of a 25 basis point rate hike. The Press Release on Monetary Policy Review is expected on Friday, 23 June at 7.30 am. showed, to boost faltering growth hit by adverse weather. (SRR) to stay at 7.50 percent. head of research, First Capital Holdings PLC. period since the second quarter last year. last month, the country's worst in 14 years. lower than the official forecast, private economists have said. and private sector credit growth in the last two months. four-year high of 28.5 percent hit in July. slowing from the previous month's 6.9 percent. percent growth a year earlier. from government securities in the first three months. Monetary Fund for a $1.5 billion loan. Sri Lankan shares rose on Friday for the third straight session to hit a near four-week closing high as investors picked up blue chip stocks. The Colombo stock index ended 0.36 percent higher at 6,718.83, its highest close since May 22, and recorded its first weekly gain in four. Analysts said investor reaction to slower economic growth in the first quarter was mixed. Sri Lanka’s economy grew 3.8 percent in the first quarter, slowing from the previous quarter’s 5.3 percent, the state-run Census and Statistics Department said on Thursday. “The first-half growth will be affected by the drought and the floods, but we expect a pick up in the second half,” said Atchuthan Srirangan, a senior research analyst at First Capital Holdings PLC. Turnover on Friday was 966.4 million rupees ($6.3 million), above this year’s daily average of 899.4 million rupees. Foreign investors were net buyers of 63.3 million rupees worth of shares, extending the year-to-date net foreign inflow to 20.71 billion rupees. Inflation could rise in the short term, especially due to crop damage and difficulties in distributing fresh-food produce and staple food items, analysts said, after the recent floods and landslides, caused by the worst torrential rains in 14 years.